John Biatowas, violist, has grown up playing violin and viola throughout Connecticut and the surrounding states. He received his BA in molecular biology from Colgate University and Performers' Certificate in viola and MM in violin performance from the University of Connecticut. 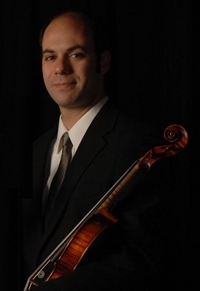 John has sat concertmaster of the Colgate and UConn Orchestras, as well as principal viola at UConn. He teaches privately and is a founding member of the Arioso Ensemble. John serves as orchestra librarian and section violist with the Eastern Connecticut Symphony Orchestra, and has also performed with the New Britain and Wallingford Symphonies and the Hartford Festival Orchestra. He teaches chamber music at Wesleyan with his fellow quartet members. His teachers include Theodore Arm, Laura Klugherz, and Phoebe Barron.